Summon: Give a creature +2/+1. Frenzied Witchman is a common Neutral creature card. It is part of the Core Set. This card's summon ability applies the Frenzy card effect. 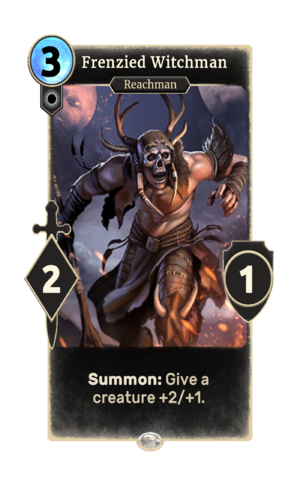 The card's art depicts a Reachman dressed in ESO's Barbaric Style gear. This page was last modified on 15 February 2019, at 22:08.